Can the same user account login at the same time from different locations? Can I receive upload/download notifications via email? If I start on one of the smaller accounts, can I upgrade? Is there any easy way to access files across all of my spaces? Can the Web Portal and traditional FTP client software be used together? How do I create multiple user accounts? 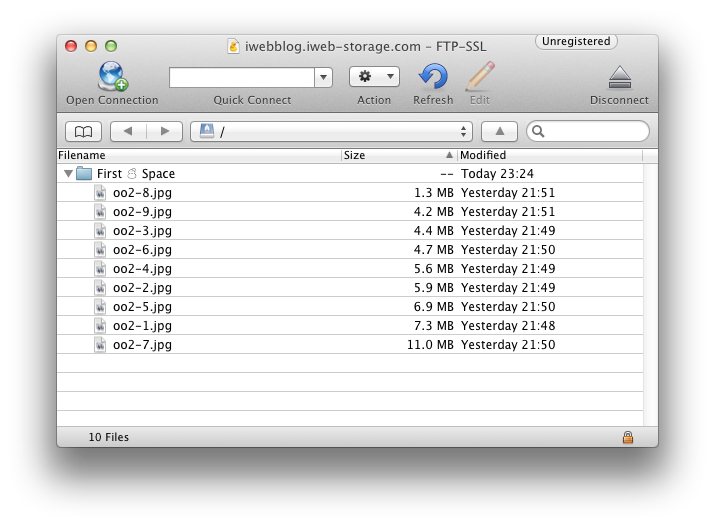 iWeb FTP Storage is a web based service that allows you to securely exchange files online. Your account comes with your very own web based portal. There is no software to install and the interface can be branded as your company. You can upload / download / move / rename and delete files and folders through the interface. Immediately after first logging into your account you will be presented with the welcome screen. 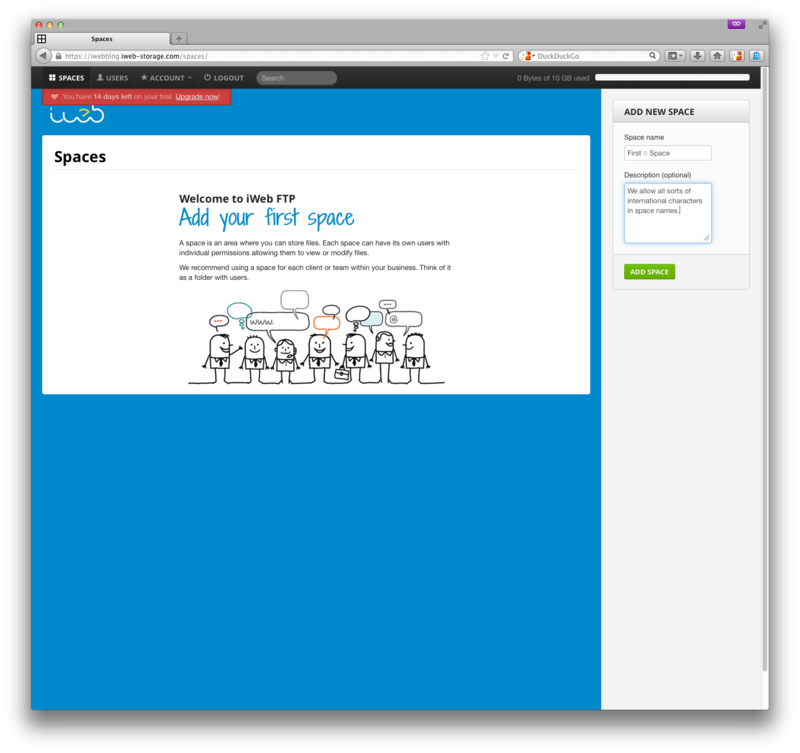 The introductory text explains that you'll want to create what we call a `space`. A Space is an area of our filesystem allocated to you. 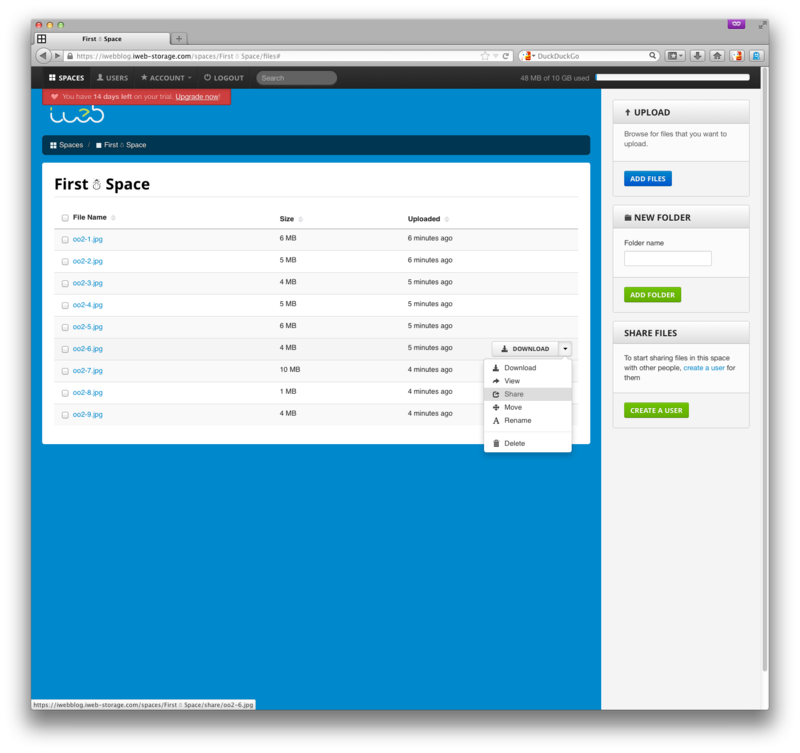 Files that are uploaded to a space can be accessed by users that you create. 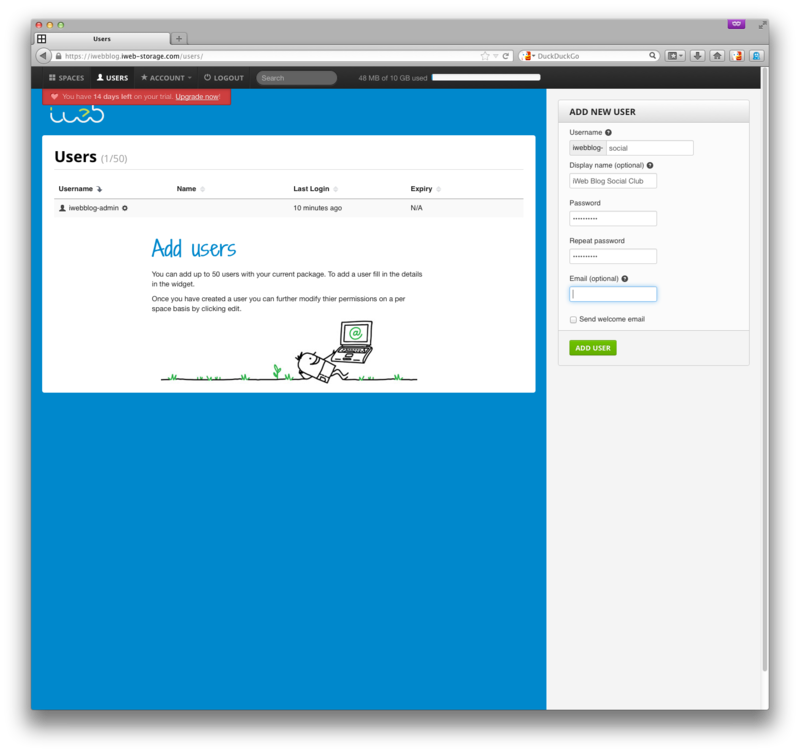 You control which users have access via your simple to use control panel. Enter a name for your space to create it, we fully support internationalisation with UTF-8 and iWeb FTP will work with files and filenames from any language, but not all client software and web browsers can handle all file names; you may want to test before putting unusual characters (like this 'little snowman' in space or file names. We give you your very own brandable web based portal where you can upload and download files without any having to install any software. Alternatively you can transfer files via traditional FTP clients such as FileZilla or Transmit. 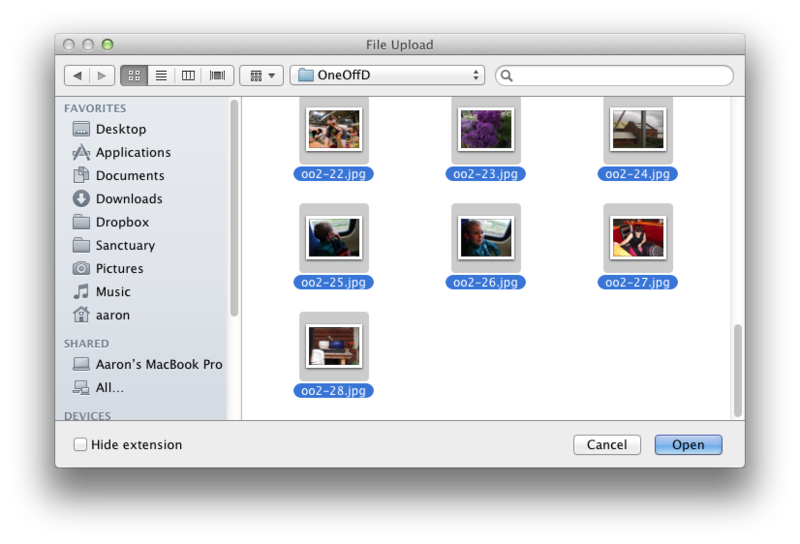 Click `Add Files` on the right to select some files to upload. You're not limited to uploading one file at a time but, due to limitations present in current web browser software, you can't upload whole folders through our web interface. However, you _can_ upload folders over FTP, covered later, and you can create folders through the web and put files into them very easily. Once you've made your selection click `Upload Files` and you'll be able to watch the progress of your files going up to the new space. Can I use an FTP client to access my files? The first time you connect securely, you'll be presented with our secure certificate, and asked to verify that its secure; just check the box saying to `Always trust certificate in future sessions` once you're happy. Yes. 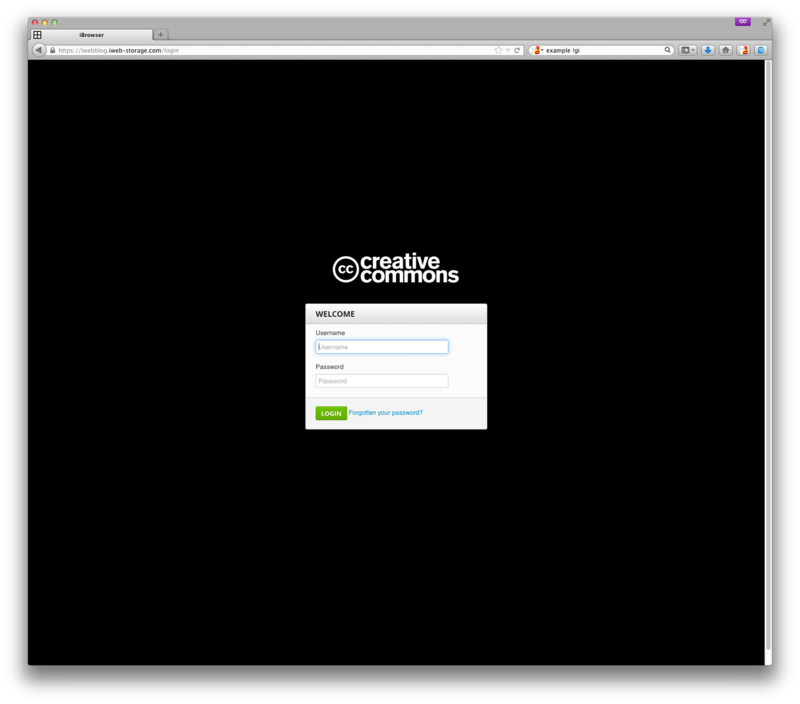 The administrator user has access to all of your created spaces and files. Yes. 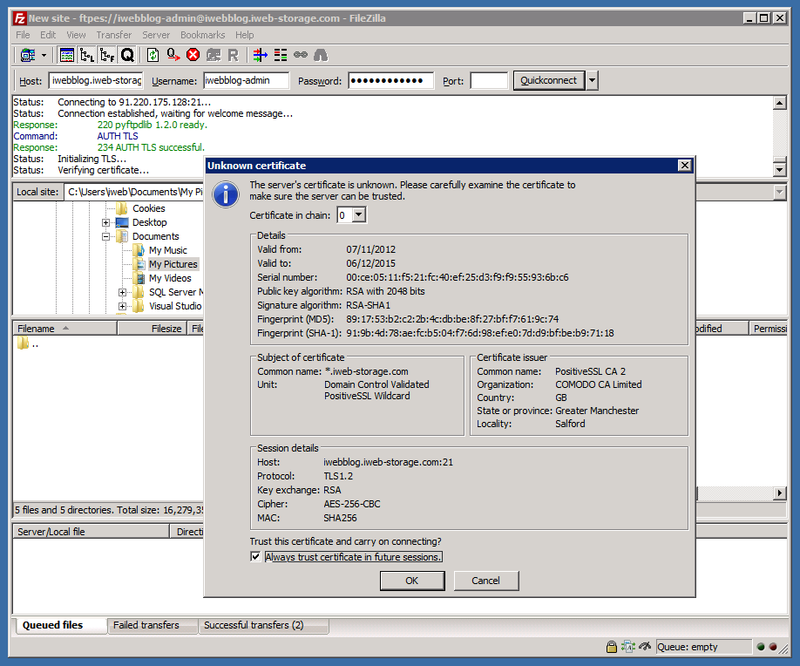 The same username and password will work if connecting via traditional FTP client software or via your branded web portal. 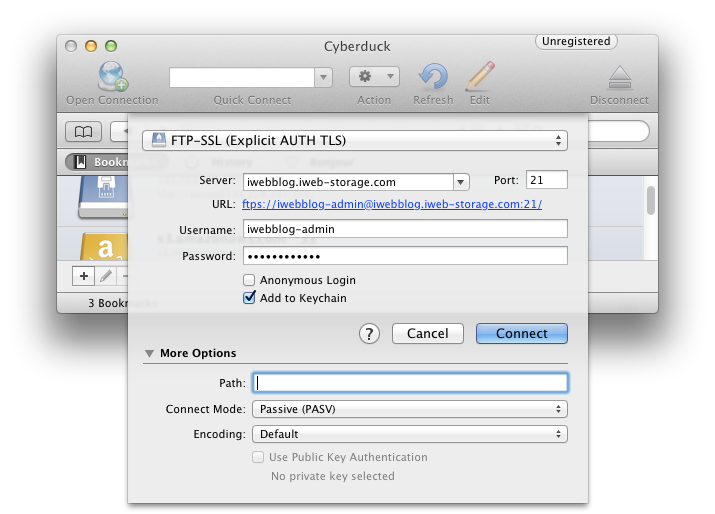 Each package contains a number of FTP user accounts that can be created. 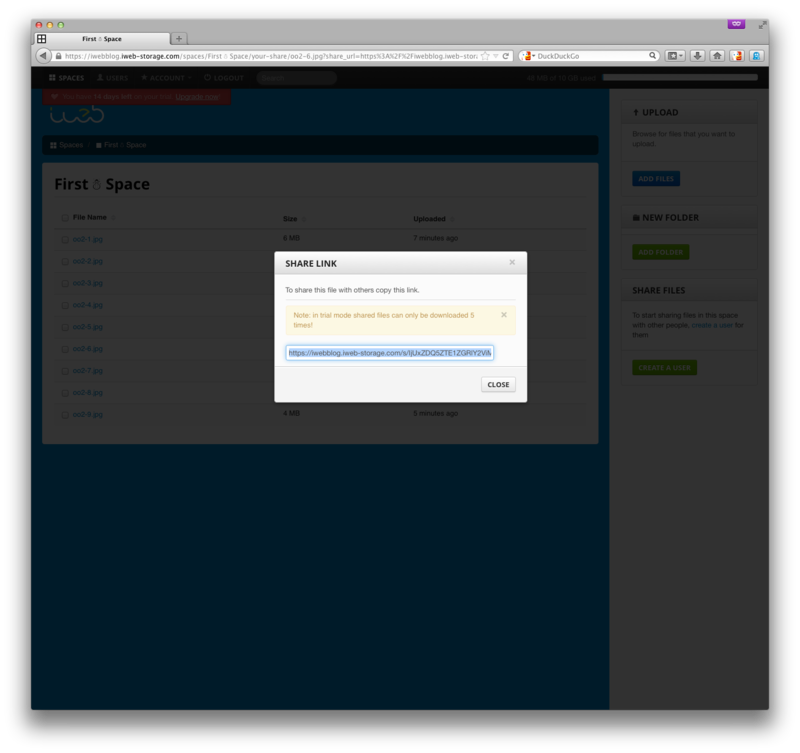 Each user account can be assigned access to a `space`. Permissions for a user can be set for each space, so you could grant them read/write access to one space and read only to another. We can create a user, via the `create a user` button on the space page (you can also manage users from by selecting `Users` from the menu at the top of the page). A user doesn't need to be a single person, it could be a company or a group of people that you want to give access to a space. Can I share files without creating a user account? Yes it is possible to create a share link, a unique URL that's email friendly and that the recipient can use to download a file straight from their browser without even having to log into iWeb FTP. 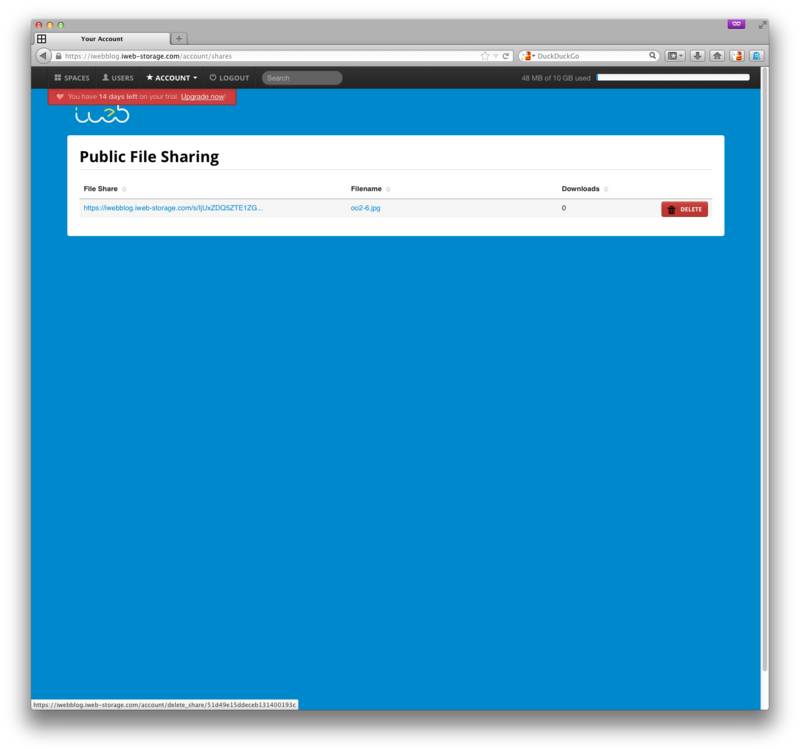 The `Share` option exists on every file if you're an administrator, and the files in any spaces which you have the share permission on, for regular users. If you ever want to view your list of file shares, or revoke one after it has been sent out, you can do that by going to the `Account` menu and selecting `File Shares`. Yes. this is called concurrent connections and we allow this. You may choose to setup one username and share this login with many people (they may be all working on the same project for example). If you need to identify who has logged in then you would need to define multiple users so you can give each their own username for auditing purposes. Yes. You can choose between upload only, download only, both or none. Notification permissions are set at a per user / space level, giving you complete flexibility. Can I see who has uploaded and download files? Yes. 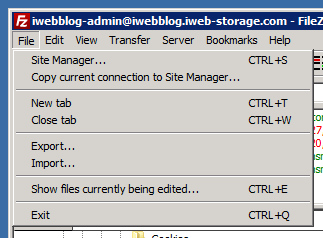 iWeb FTP logs all tranfers to an actvity log. 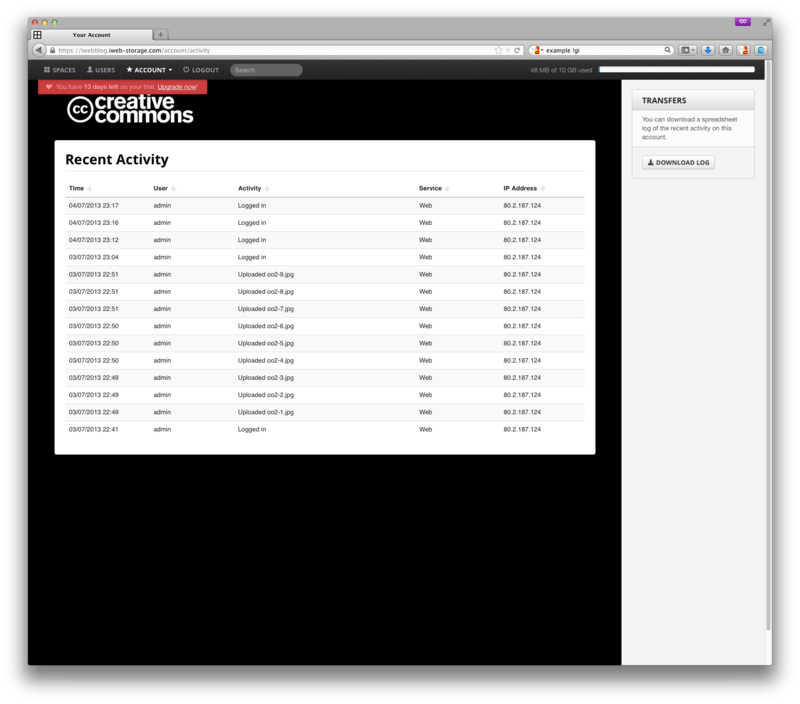 You can view the activity log by clicking that option under the `Account` menu. For each upload, download and log in event the IP address, user, and which service was used are logged. You can also export a version of this log which can be further processed in a spreadsheet and other tools, for reporting purposes. Can I enable certain features for one user, and not for another? Yes. You can enable permissions such as read / write only, and email notifications on a per user basis. Can I customise the interface to match our companies brand? Yes. You can personalise the interface with a custom colour and logo. This is done through your simple to use control panel, no technical skills are required. If you're collaborating with people outside your business or simply want to make iWeb FTP feel more on-brand, you can customise the look of your account. 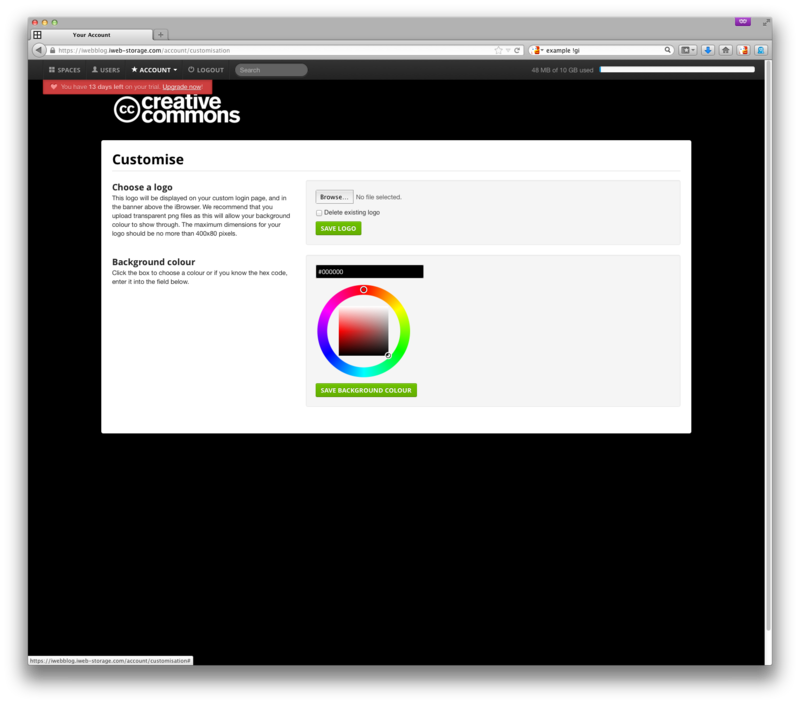 A custom image can be inserted onto the log in screen; this will be repeated at the top of every page for users logged in via the web, and you can change the background colour of the interface; either to match an uploaded logo, your signature colour, or just to have something different. These changes carry over to share links, too! Click on the `Account` menu and select `Customise`. 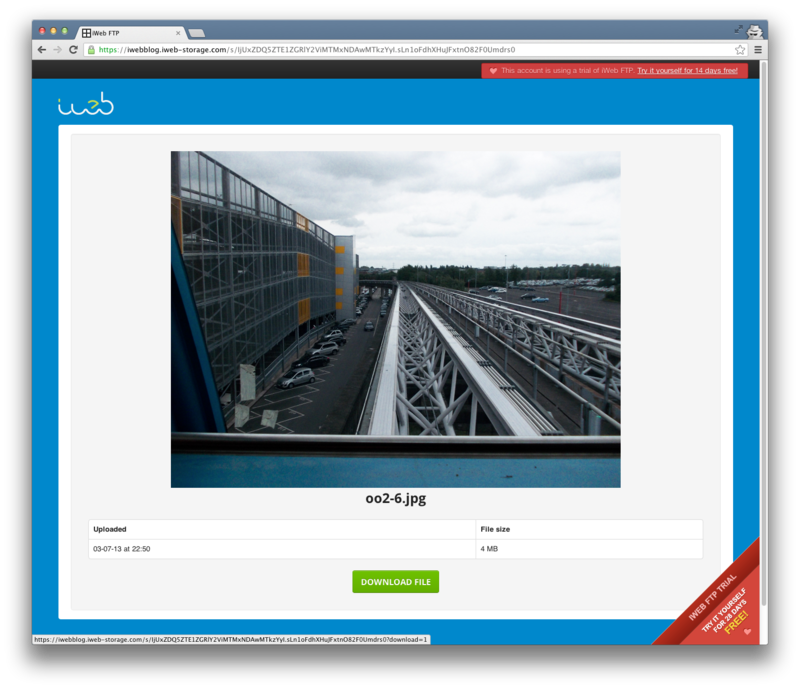 You can upload an image here (remember to click `Save Logo` for it to take effect). If you're having trouble matching the background of your logo using the colour picker, you can enter in a hex code - your logo designer should be able to provide this to you. What are your credentials? Who are iWeb? iWeb launched back in 1995, when the Web was still in its infancy - so we were there right at the beginning. The services we offer may have evolved over that time, but our approach is still the same. We provide cutting edge solutions that utilise the latest technology and trends. We are a physical business based in Staffordshire with 21 employees. We have been offering online storage services since 2005. For more information about us please read our about us page. We take security very seriously and have built our service from the ground up with this in mind. Read more about our approach on our security page. 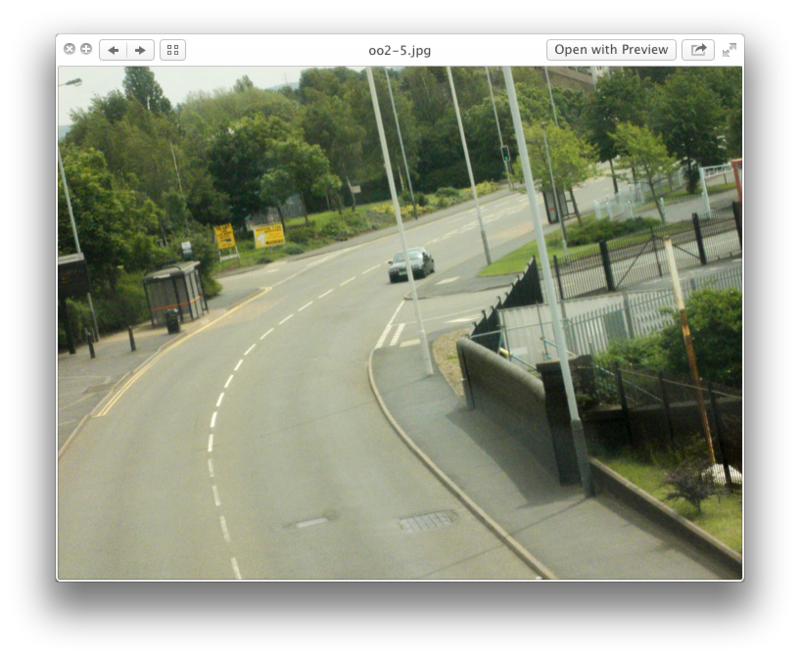 Do you host all your files within a UK datacenter? Absolutely. Our service is hosted on securely contained servers within in a premium UK based Data Centre. We own and manage all of the storage servers. Read more about our approach on our security page. We offer a rolling monthly contract to keep things simple. Yes, we will instantly upgrade your account to the larger account and bill you for the new package on your next monthly billing cycle. We accept all major credit and debit cards via your control panel. We use SagePay to tokenise your payment card details. At no point during any transactions do we have access to your card details. We charge your account against the token we are provided with by SagePay. Alternatively accounts can be paid by invoice. Simply complete the required details within your control panel and select the option to pay by invoice. Yes. A VAT invoice can be obtained via your control panel.